The table was set for a wonderful Afternoon Tea with close friends to celebrate a milestone achievement. 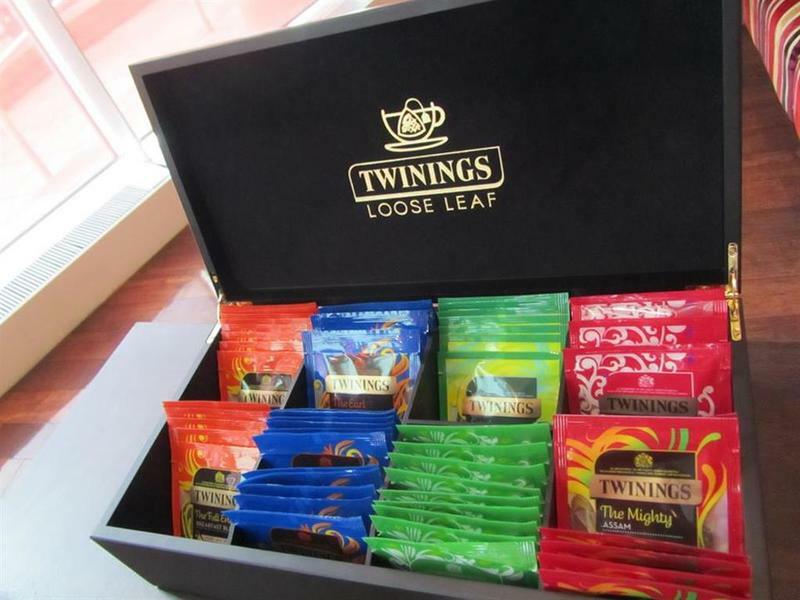 A black treasure chest full of the colourful array of Twinings teas was presented to us by Axis. There was Traditional English, Earl Grey, Assam, Peppermint, Green Tea, Red Berry and Camomile all in tea pouches. Throughout the afternoon, the staff gave us the choice to have different teas. The teas started off with the full bodied Assam with milk and then went towards the lighter but just as flavoursome Red Berry and Peppermint ones. 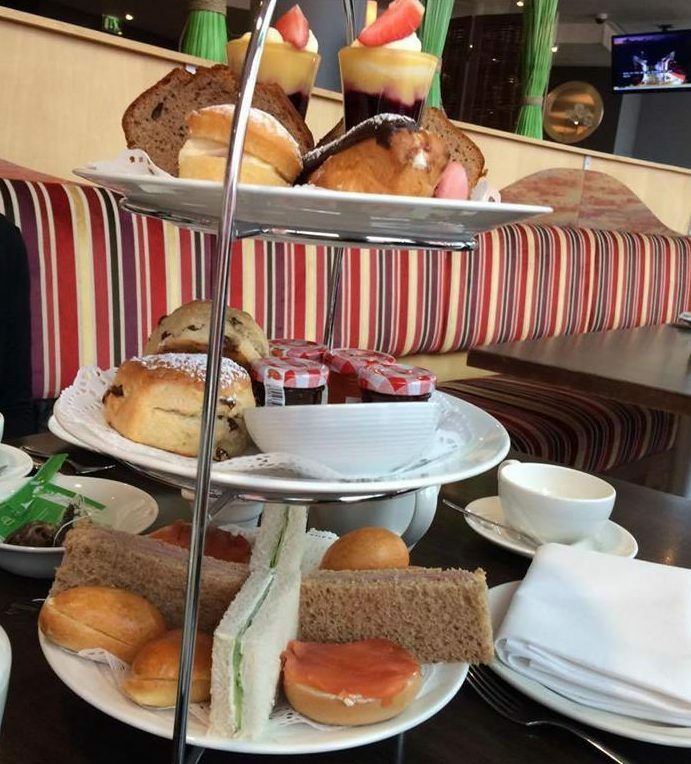 The three tiers of the Afternoon Tea were delightful. 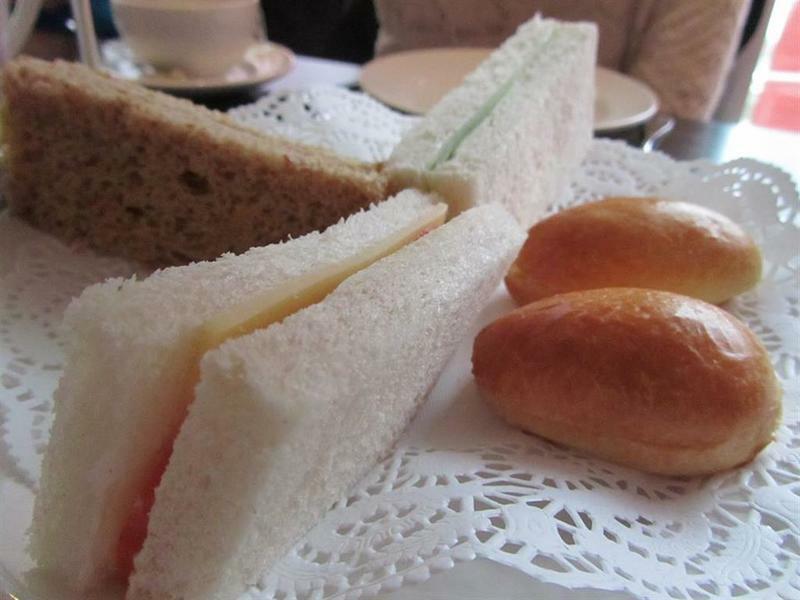 The finger sandwiches were cucumber with cream cheese on white bread and honey roast ham with mustard on wholemeal bread. The savoury food had the added selection of butter brioche of egg and cress mayonnaise and also a bagel topped with smoked salmon and Philadelphia. One of the bagels was replaced with a cheese and tomato on white bread as requested. It was nice to have the variety of brioche and bagels with the sandwiches. The fillings were complemented by the different breads. 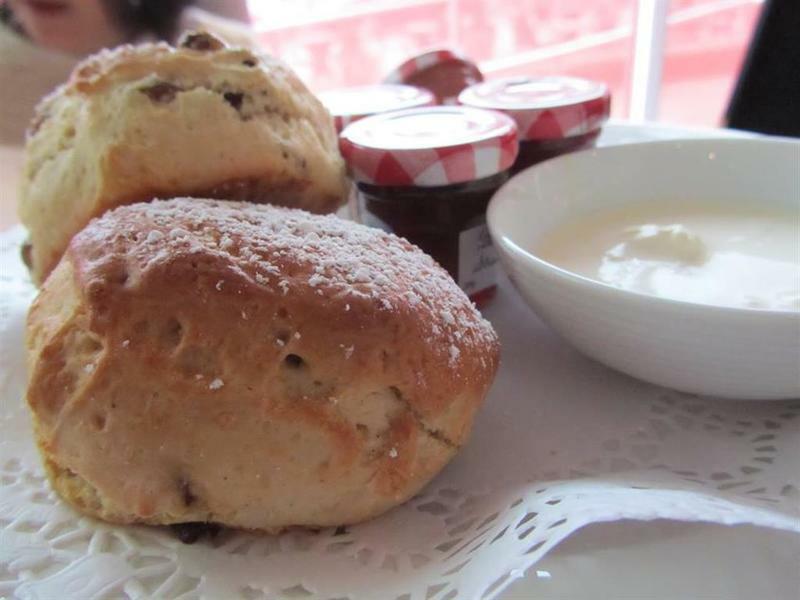 As always, the middle tier had the baked fruit scones. They were of a good size and dusted with icing sugar. Axis sources award winning clotted cream from Dorset’s Blackmore Vale, which has been producing it since 1958. A dish of the clotted cream was accompanied by individual pots of Bonne Maman strawberry jam and marmalade. The sweetest tier was made up chocolate eclairs, Victoria cake, mini macaroons and slices of coffee and walnut cake. All of the sweet treats were super and each one was so fresh. The highlight had to be the trifle in the shot glasses. Fruit, sponge, custard and cream are the best combination and one which can never be too much. The Afternoon Tea had filled us up but there was an added element to end our day. 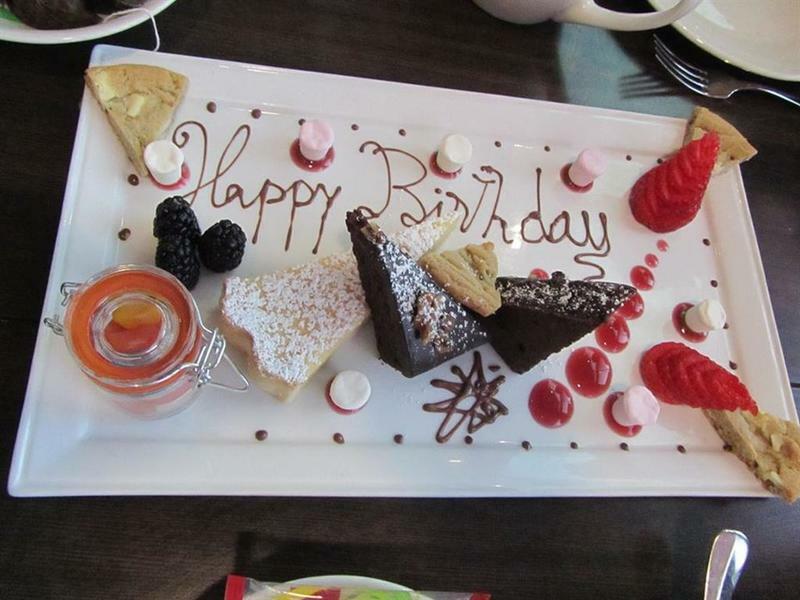 It was really thoughtful and lovely of Axis to bring us a surprise birthday treat and we were taken aback. A cake platter was beautifully presented with lemon tart, rich chocolate cake, chocolate chip cookie triangles, strawberry towers, blackberries, mini marshmallows, raspberry sauce, chocolate sauce and a little jar of sweeties. Even though Axis Bar and Restaurant is part of a hotel, the dining area is fairly big and separated into a few sections. The decor was deep reds and golds and cushioned seating with dark furniture. The staff were friendly, efficient and gave us good service. Everything at the Axis Bar and Restaurant was great. 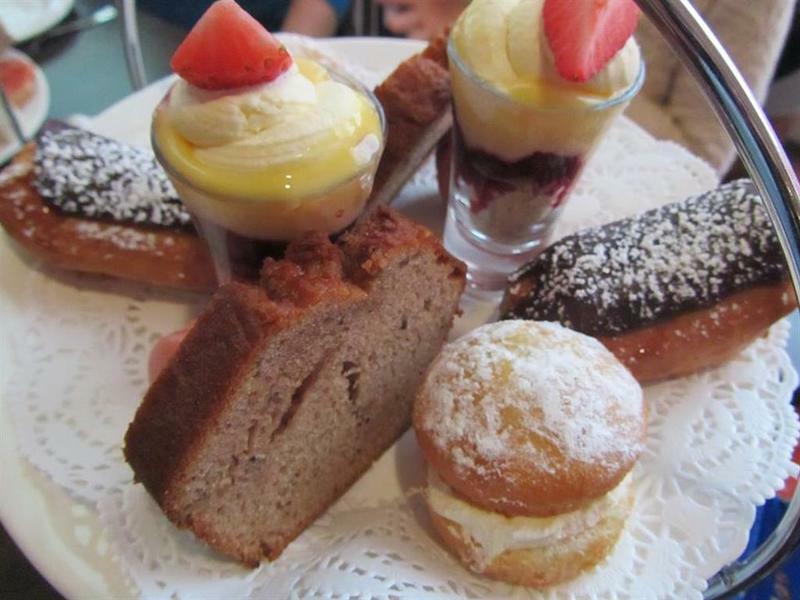 It was really nice that they had taken the Afternoon Tea selection to another level with the different breads, bagels, fresh cream cakes and trifle. It made for a happy memorable occasion with friends and one which will always be treasured. 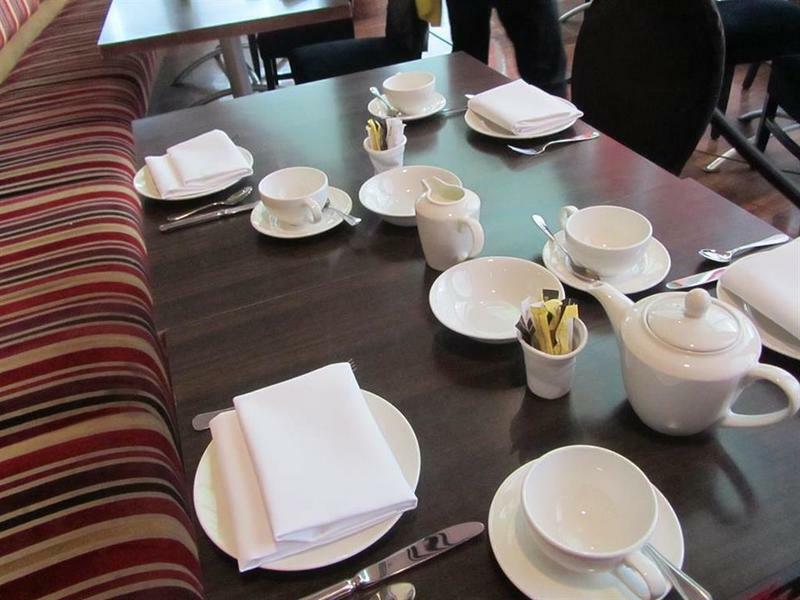 I went to the Hilton at Angel Islington this week for a relaxed coffee and cake with a friend – or so I thought. It was awful! We waited ages for our cake. By the time the cake was served the coffee was finished or very cold. I was very stressed and I will never go there again. Its better going to McDonalds!